Question #67: Utilizing 1 John 2:2, prove unlimited atonement. Provisional salvation for the world. Answer (Part 1): “And he [Jesus Christ] is the propitiation for our sins: and not for ours only, but also for the sins of the whole world” (1 Jn 2:2). The wording of this passage is a clear proof for unlimited atonement. More specifically, here we see evidence for unlimited provision for salvation (for the sins of the whole world) and yet also for limited redemption (the propitiation for our sins). This is the generical approach. Gary Long presents five objections and three alternative interpretations. Objections: 1) terminological – “world” can and does have more than the meaning of all mankind generically (Jn 1:10, 11; 3:17; 12:31; 17:6, 9, 11, 18, 21, 23-24), 2) logical – “whole world” cannot refer to all mankind generically in a salvation context, for the non-elect do not receive all or any of the gifts of saving grace which (according to Rom 8:32) is assured to them if, in reality, Christ actually died for them, 3) contextual – how can propitiation be absolutely universal if Christ’s advocacy is not (1 Jn 2:1)? 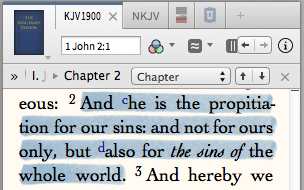 4) grammatical – the text does not say that Christ is potentially the propitiation for “our sins” and “the sins of the whole world” and 5) biblical – all other occurrences of “propitiation” (Rom 3:25, Heb 2:17 and 1 Jn 4:10) are restricted to believers. The three alternative interpretations are: 1) geographical interpretation – “our sins” refer to the recipients of John’s epistle in Asia Minor and the latter part of the verse to Christians everywhere outside Asia Minor or churches throughout the whole world, 2) eschatological – the future “world” that is saved at the second coming of Christ including all the elect from all ages, and 3) ethnological interpretation – stresses that some without distinction, not all without exception, out of the Gentiles as well as out of the Jews (Rom 9:24) have had their sins propitiated by the death of Christ.In Answer (Part 2) I will offer my objections to Gary Long’s presentation and why I hold to an unlimited provision of salvation. Stay tuned. Previous Previous post: God declares you righteous!